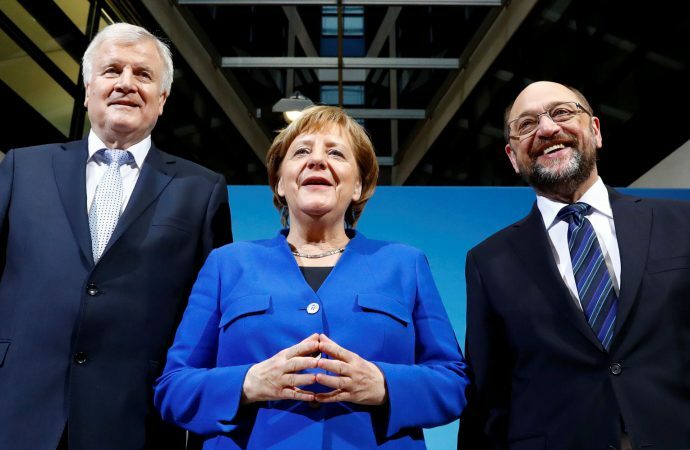 Following preliminary talks earlier this month, 600 SPD delegates will vote in Bonn today on whether to proceed with full coalition negotiations with Angela Merkel’s Christian Democrat Union (CDU). The SPD’s leadership has backed pursuing a renewal of the partnership that has governed Germany since 2013, arguing that it is the party’s only way to influence policy. However, the party’s grassroots have made their displeasure known. The SPD’s Berlin branch voted against holding talks and the Jusos, the party’s student wing, has loudly voiced its disapproval. They contend that the CDU’s concessions are too little and that a stint in opposition could remedy a disastrous 2017 electoral performance. Today’s result looks uncertain. A no vote could see Schulz resign his post and would dramatically increase the prospect of fresh elections; the outcome would likely be another fractured parliament, perhaps with an even higher vote for the far-right AfD. Even if the delegates approve talks with the CDU, the proposed coalition will have to be negotiated and then voted on by the SPD’s 450,000 members, meaning the grassroots could snuff out a grand coalition yet.